Severe error(s) occurred in phase PREP_INIT/VALCHK_INI! Below resolution was done on Windows operating system environment. The solution will be similar on UNIX, Linux operating system environment. 1. Stop the SAPup process (stop the SUM installer). Navigate to the \SUM\abap\bin directory (path where you extracted the SUM installation files). The tool will reset the whole procedure now. Integration of change requests was reset. 3. Delete the directory of C:\SUM. Once done, extract again the SUM with a new name. Rerun the SUM from beginning. 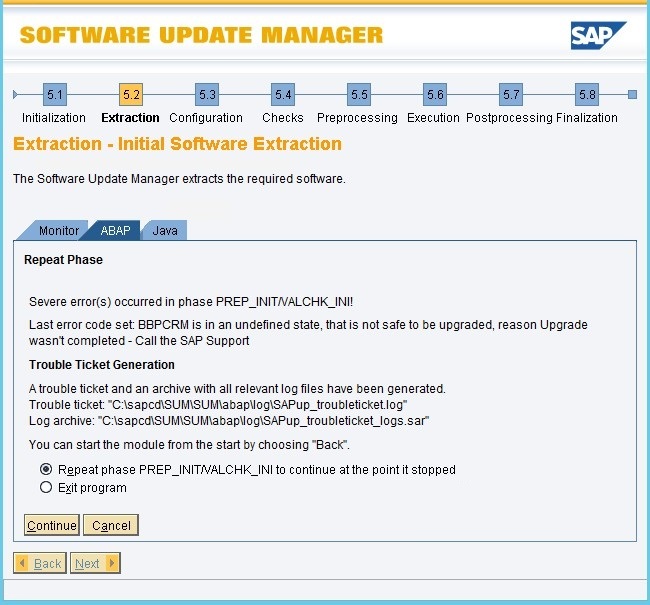 If the above steps are not working, you may need to download a new patch of SUM version from the SAP Service Marketplace and try with it.